Prices may vary. Subject to availability. Subject to change without notice. **Home prices based on 35’ front setback from curb, lots are cleared and filled to grade. All driveways and sidewalks are concrete. Specific features may vary by plan. All Features and Specifications are subject to change per Contract. Enjoy the good life at Halifax Plantation. Live within minutes of pristine Ormond Beach. The drive home down Old Dixie Highway through Tomoka State Park is aw-inspiring. 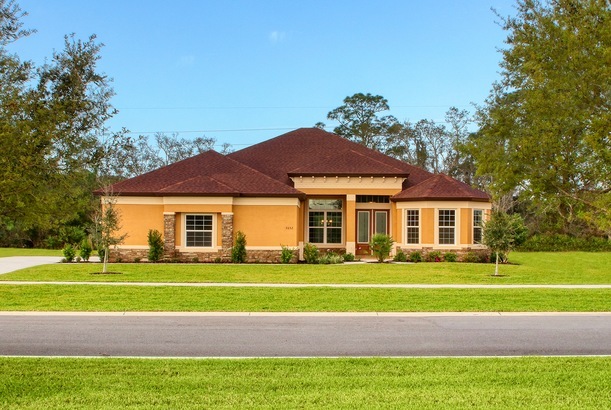 The Estates are the next big thing in luxury living at Halifax Plantation. Now offering seven luxury plans designed for today's most discriminating buyer. But don't wait, only forty-nine estate homesites are available. Imagine early morning walks and bikes rides along winding tree-lined boulevards right here in the community. Take the time, make the drive, fall in love and call it home. Welcome to The Estates at Halifax Plantation.